Another year has passed, which means new and exciting ATV models have hit the market. Nowadays, these machines are coming with more features at better price points. Power steering is becoming a standard feature on a lot of new machines, which is a nice thing to have. The 4×4 market is gaining new models every year, which is a major plus; unfortunately, the sport-quad side of things is beginning to dwindle. There are less offerings of sport ATVs than we have seen in a long time. Yamaha’s Raptor 250 and 125 have become more difficult to find, along with Kawasaki’s KFX450 and Can-Am’s DS 450, but they are out there, so contact your local dealer and they can help locate them for you. Some machines aren’t getting updated this year, like Honda’s TRX450R that remains unchanged from previous years with its steel frame and carburetor. We hope that as time goes on we will see more thrilling sport ATVs hit the market again as technology keeps advancing. However, there are still great options to choose from at great prices. 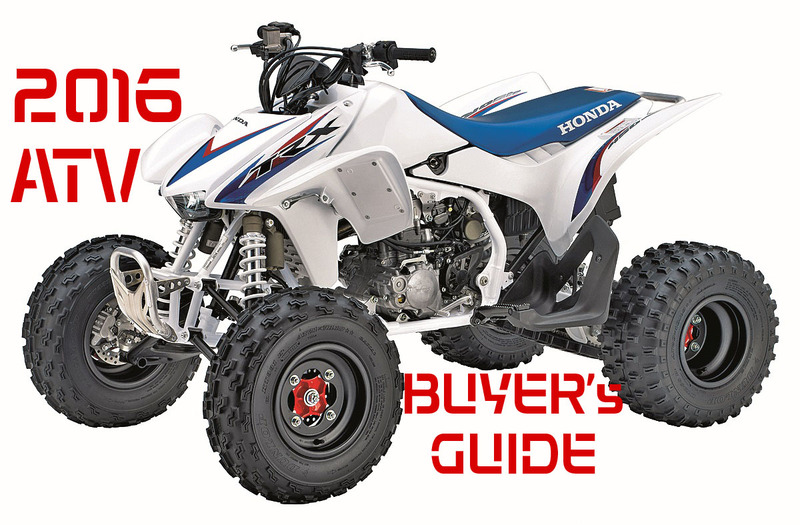 Assembled in the pages that follow are photos, prices and descriptions of over 80 ATVs that are out for 2016. The prices listed are base MSRP, so depending on your destination, better deals await you. Click on the links below to get to the machines you want to see!